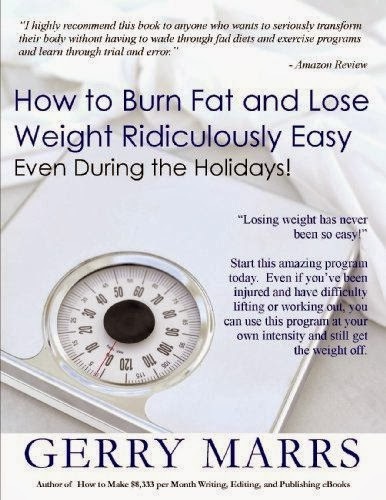 Gerry Marrs' "How to Burn Fat and Lose Weight Ridiculously Easy: Even During the Holidays!" is a comprehensive weight-loss book that tells you how to lose weight quickly, safely, and easily. If you're looking for a book with the latest diet gimmick that'll tell you how to lose 30 pounds in a week if you only eat some strange fruit, then this is not the book for you. This book is based on methods of weight loss that are proven to work. So why buy this book if it doesn't contain a new diet fad? Because it tells you how to do tried-and-true methods as effectively as possible. For instance, everyone knows that limiting carbs is an effective way to lose weight. But this book tells you how to implement lowering carbs into your daily life in a way that is extraordinarily simple. The best thing about this book is that it covers the gambit of what you need to do to lose weight -- from dieting to exercise to sleeping properly to avoiding stress to using a heart monitor. Overall, this book is perfect for anyone who is committed to make simple yet effective lifestyle changes that will result in weight loss. Thank you for the kind words on my book!